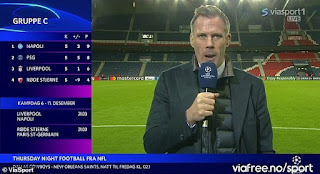 Jamie Carragher has slammed Paris Saint-Germain players for diving in their Champions League victory over Liverpool on Wednesday night. Reds manager Jurgen Klopp took a swipe at the Ligue 1 side's gamesmanship as another away defeat in Europe left Liverpool facing a final group game cliff-hanger. It was Neymar, whose actions incensed Liverpool's players as he was the main protagonist in some serious gamesmanship from PSG. Former Liverpool defender Carragher understood where Klopp was coming from and labeled the Brazil star as 'embarrassing'. 'It was very frustrating. I think with Neymar it was even in the first half, we're talking about one of the best players in the world, but watching him tonight was embarrassing,' Carragher said on Viasport. 'If he continues that through his whole career, he's going to be remembered for that rather than the great player that he is and it leaves a sour taste in the mouth really and I have no sympathy really with the PSG players if Klopp is frustrated with them, that's understandable. 'Even Thiago Silva, the captain, the centre back, rolling around in the corner near the end holding his face. 'This great team PSG with great players, they don't need to resort to these tactics, they should let the football do the talking. 'You're frustrated as a Liverpool supporter but as a football fan, people all watching around the world they should be embarrassed. 'I don't know how they go back and speak to their families and wives in the players’ lounge. Liverpool can still reach the last-16 if they beat Napoli 1-0 or by two clear goals on December 11.